Shredding sensitive information is a sure fire way to protect it. But which type of shredding program is right for your office? Here we make the case for shred-all policies. 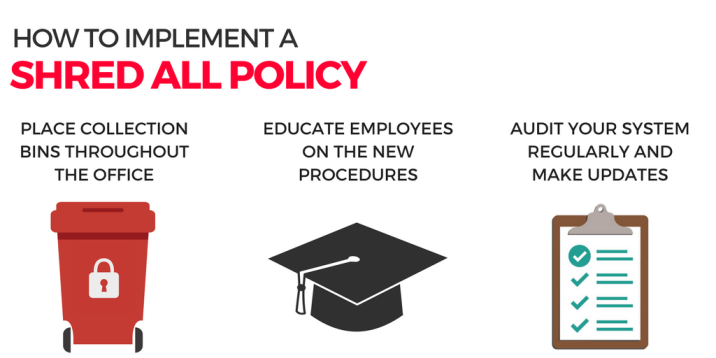 Watch the video or read the transcription below to learn more about what shred-all policies are, their advantages, and how to implement one at your organization. With a “shred-all” policy all documents are shredded once they’re no longer needed. Instead of employees determining what needs to be shredded, a shred-all policy removes the decision making and simplifies the process down to—as the name implies—shredding everything. Each day businesses handle sensitive information ranging from account and business records to personal information and legal documents. Even if the information may seem harmless, simply trashing documents can lead to serious consequences like loss of customers’ personal information and internal business information being compromised. With a shred-all policy though, businesses can significantly reduce the odds of an information breach by simply limiting the amount of information there is to lose in the first place. Shred-all policies come with several benefits ranging from protecting your businesses to simplifying the decision-making in what and what not to shred. Although many data breaches are malicious, there are also many caused by accident. Sensitive information that piles up or isn’t properly disposed can eventually be misused and lead to the high costs and consequences of a breach. With shred-all policies on the other hand, the chances for disaster are drastically reduced, as the system leaves no security gaps for sensitive information to slip through and into the wrong hands. The primary purpose of a shredding policy is security, but when an employee is making the decision on whether or not to document is sensitive enough to shred accidents inevitably happen. An advantage of a shred-all policy on the other hand is how it can simplify shredding by eliminating the decision making process entirely. By shredding anything and everything instead of selectively, a policy can help to save time during the course of the day along with greatly reducing the chances of a costly data breach. Laws like HIPAA and FACTA outline requirements for protecting information privacy and even accidental violations here private information is lost or breached come with steep fines. By ensuring that every document regardless of how sensitive it might seem is destroyed, a shred-all policy helps businesses to close any gaps for potential noncompliance with industry regulations. Because of the simplicity of a shred-all policy, implementing the system is fairly straightforward. To get the ball rolling and put the plan in place there are typically three main steps to take. Before actually putting the policy into effect an office space should first be prepared for constant shredding. Because of the time and potential security risks with using personal shredders in the office, businesses often place locked shredding bins in central locations to collect documents for a shredding provider to regularly pick up. Along with these bins, it’s also recommended to have instructions prepared and posted near containers for who to notify and contact when containers are filled up. Although it does break the routine of daily workflow, it’s much easier for employees to transition into a shred-all policy because of how little training it requires. Once your employees understand the importance of shredding all documents even if they seem like they may not be sensitive, the only real process to teach employees is walking over to a shred bin to place unneeded documents for shredding. Internal auditing for shred-all policies helps to identify potential security risks and ensure every document is still ending its life cycle in a shredding container. By doing regular assessments of shred-all policies, policies can be regularly updated and improved to ensure you’re keeping up with changing legislation or any issues found during an audit. Planning for a Shred-All Policy? Get help finding shredding partners who’ve been trusted by Apple, Amazon, and a range of other companies to handle their regular shredding needs. Call Shred Nations at (800) 747-3365 or fill out the form on the right to get free quotes on mobile shredding and offsite shredding services from several providers in your area.